The month of September looks good on Kerry Washington as she covers the latest issue of Self Magazine. Rocking a green one-piece with a blue insert, the #SelfMade issue centers on Kerry’s ability to balance her popular role on hit series, Scandal, while being a new mom and taking care of her body irrespective of her busy schedule. We also get to learn what she thinks being a self made woman is all about. In a short clip below, Kerry talks what motivation means to her, how she uses Pilates to find focus while strengthening her core, while pulling off some impressive moves for the camera in a little cleared corner of the Scandal set. Now that I’ve been playing Olivia Pope for 4 years I feel like she’s taught me so much about who I want to be in some ways, and who I don’t want to be. Characters come into my life sometimes when I need to learn something from them. I was introduced to Pilates about 8 or 9 years ago. I got really injured while I was training and I needed to find a way to work out that was both rehabilitating and challenging for me physically so I could still stay in shape, and Pilates was the answer to all of my questions. The key to really being successful as a self made woman for me has been learning to ask for help. Each of us is incredibly unique, we each have things that we can offer the world that nobody else can because you are you. But I can’t really be myself fully until I allow people to help me. And then we can really be our full selves. Kerry Washington in magazines looks quite odd. It’s either she’s overly airbrushed, photoshopped, skin color or body is not a true representation of her. I’m not sure if she requires them to make her appear a certain way or these magazines fail at their job. cheek bones to die for. I think her star is fading. she needs to find more film projects to do and pls she should start showing her husband some more. 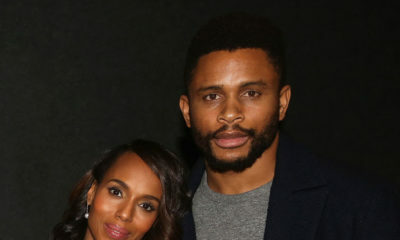 I want to see nnamdi. I love how these celebrities always bounce back after having a baby. Very commendable! One woman I love. Just can’t stop watching scandal. It’s strange that after checking her name to know who she is ( only to find out that o already know her), I keep checking to remind myself who I’m reading about . Can it be that hard to take a picture and adjust slightly ? Maybe a black person should do the photo editing or photoshopping ????? I love her. But she looks hungry though. Oh and frail.